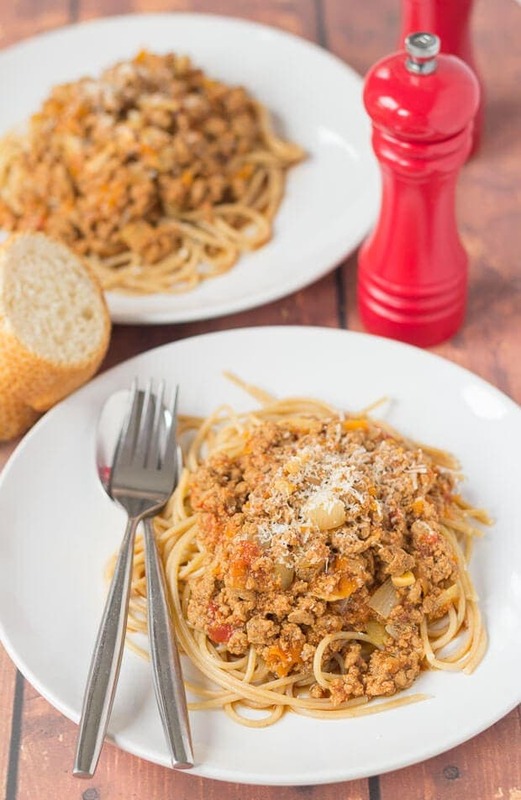 Quorn spaghetti bolognese is a fantastic vegetarian version of the traditional meat based Italian classic. In pretty much 30 minutes you’ll have this amazing family meal ready to serve and even meat eaters will love it too! Even meat eaters will love it too. That’s quite a claim for this Quorn spaghetti bolognese isn’t it? But seriously folks, I’m quietly confident that they will. After all I speak from experience. Lady Lynne and I were once complete meat eaters, until we introduced Quorn into our lives and began to use it as a substitute for red meat. 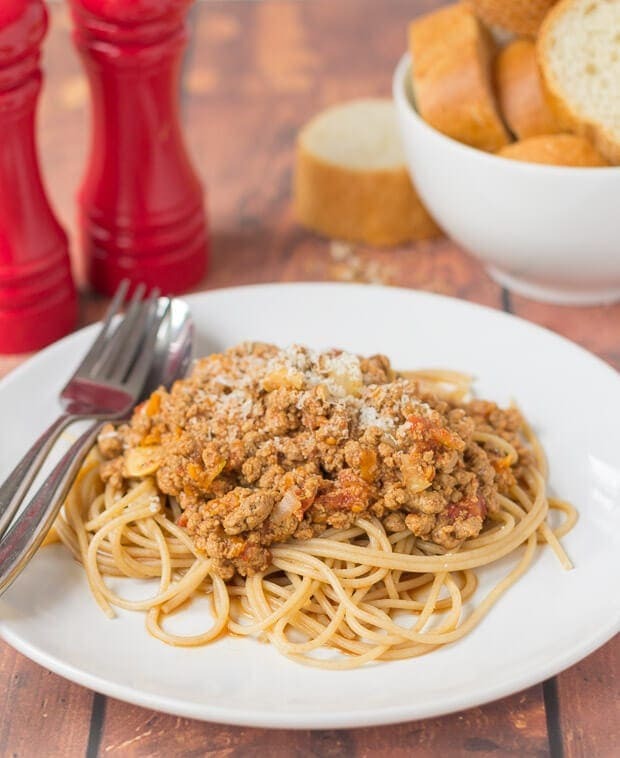 This delicious alternative bolognese isn’t any more difficult to make that the traditional meat based version either, nor does it take any more time to cook. It’s still crammed full of onions, mushrooms, tomatoes and herbs. Plus, you’re not loosing out on any protein with nearly half of your daily recommended amount provided by one portion. You’ll still recognise the familiar comforting flavours in this bolognese and you can make it all in one pot, so cleaning up isn’t a problem. Just add pasta and you have a perfect family meal. The sauce can be easily frozen too which really helps when you are trying to prepare meals in advance. So why not dig in and give this alternative Quorn spaghetti bolognese a try? Now I would like to point out that Lynne and I are not vegetarians. Meat and red meat in particular still have a place in our lives it’s just that we choose to eat a lot less of it. In fact I could go as far as saying that red meat for us is actually a treat. Red meat can still form part of a healthy diet though and we are not in any way against it. It’s just that we in the west eat far too much of it and it could be a contributing factor of bowel cancer. Its far healthier (and recommended) to eat more white meat (chicken and turkey), fish (one portion of white and one oily fish per week) and lots of fresh fruits, pulses (beans) and vegetables as opposed to red meat. This diet is more commonly known as the Mediterranean diet. Quorn can help you as a meat replacement to some of your meat based traditional meals. 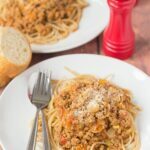 If you enjoyed this Quorn spaghetti bolognese, then why not try some of my other Quorn recipes? Quorn Meatballs – how to make tasty Quorn meatballs in under one hour. Baked in the oven and with a delicious tomato sauce this is an excellent meat free weeknight family meal! Vegetarian Quorn Cottage Pie – full of veggie goodness and flavour. If you’re watching your weight or just looking for a delicious meat free quick healthy meal, you’ve come to the right place! Homemade Quorn Burgers – How to make homemade Quorn burgers. These tasty homemade Quorn burgers are really easy to make and an ideal vegetarian meat substitute for you or your vegetarian friends cooked on your stove, or on your BBQ. 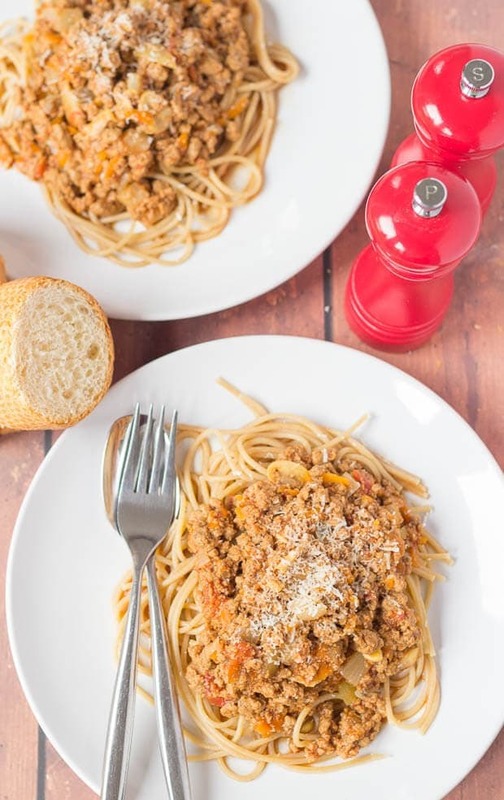 Quorn spaghetti bolognese is a fantastic vegetarian version of the traditional meat based Italian classic. Add the onion, mushrooms and grated carrot and saute for about 5 minutes until onion is softened. Stir the Quorn mince into the sauteed vegetables until well combined. Then add the garlic, vegetable stock, tinned tomatoes, tomato puree and herbs. Bring everything to the boil, turn down to simmer and then season to taste. Allow to simmer for about 10 minutes, stirring regularly. Whilst Bolognese sauce is simmering cook spaghetti in boiling salted water as per packet instructions and then drain. Divide the spaghetti equally between plates and then pour the sauce over the top. Serve garnished with the freshly grated Parmesan. So, onto Thursday and I’ll be posting my first new bread recipe in what seems like ages! It’s going to be a really easy homemade whole grain pita bread recipe though, and if you’ve never baked any of your own bread recipes before, then it’s perfect as a first bake starter! OH YES… I absolutely love all Quorn products. It is so convenient and tastes really great. That’s great that Quorn is available in your part of the world Ashika! We rarerly eat read meat either – I guess normally when eating out (and still we would likely pick fish). Sometimes I get some meats like prosciutto (Oh gosh I’m embarrassed – even bacon), but this is mostly a fancy element of blogging – I’m perfectly fine with turkey bacon most of the time. But white chicken meat is our favorite one, and we always have a few packages of breasts in the freezer. Talking about pasta, meat is a good company to it, but not the most important. Cheese is something I won’t voluntarily give up on, including cheese over a bowl of pasta. This dish looks delicious, Neil! That’s great to hear of all those leaner cuts of red meats now isn’t it David? When I have a craving for cooking a lasagne with red meat David, I’ll definitely choose a lean cut beef mince of minimal 5% fat. I find that’s perfect for giving the lasagne it’s lovely “meaty” flavour without too much fat. And with the minimal amount of fat there is, you can use that to soften the onions and mushrooms as I did in my recipe for the low-cost healthy lasagne. This is a truly delightful recipe which I will definitely prepare after a workout, Neil! Thanks! There’s plenty of protein in the Quorn to repair those broken down muscles after a good workout! I’ve never heard of Quorn. It’s it easy to find? Unfortunately Jeff its not available in the U.S. It’s available everywhere else though. The closest you can get to it is soya or vegan mince. Sorry about that!